ImDisk Toolkit currently includes the ImDisk Virtual Disk Driver, the DiscUtils library for managing the formats of image files like VHD, VDI, VMDK, etc., the RamDisk Configuration Tool (RamDiskUI), and some new GUI to use the capabilities of DiscUtils directly from Explorer and add some features. 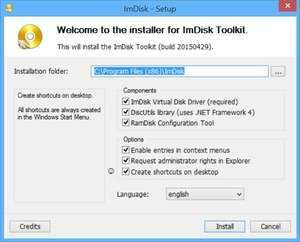 ImDisk Toolkit currently includes the ImDisk Virtual Disk Driver, the DiscUtils library for managing the formats of image files like VHD, VDI, VMDK, etc. Version 20180917 is a freeware program which does not have restrictions and it's free so it doesn't cost anything. For security reasons, you should also check out the ImDisk Toolkit download at LO4D.com which includes virus and malware tests. Additional screenshots of this application download may be available, too.